WASHINGTON, D.C. -- The United States Department of Defense has selected Julian Schuster, provost, senior vice president and chief operating officer of Webster University, for the Joint Civilian Orientation Conference (JCOC) program. The JCOC provides an opportunity for U.S. business and community leaders to engage with senior leaders of the DoD and individual service members. It is the oldest public liaison program in the Department of Defense (DoD) and the only outreach program sponsored by the Secretary of Defense. 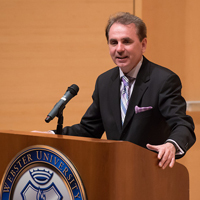 Schuster’s participation will deepen both his and Webster’s understanding of the branches of the U.S. Armed Forces, including overall policy, force readiness and the challenges faced by individual service men and women. “I am honored to be selected for this prestigious program, and I look forward to the benefits this experience will provide for myself and for Webster,” Schuster said. Among the objectives of the JCOC are to educate and inform participants about the challenges faced by men and women in uniform both on and off the battlefield. This includes help in closing the “military/civilian divide" and assisting transitioning service members. The experience will entail a full week (Aug. 14-20) where Schuster and others selected for the program will be guests of the Secretary of Defense Ashton B. Carter. Their week-long JCOC journey, which can include participation in military exercises, training and demonstrations, will follow discussions with senior officials at the Pentagon.